The Cooking Circle for special needs is back for the winter. The program runs once every 2 weeks on Monday's, 6:30-8:00 PM. This Monday, February11th , is the Challah baking class. Click here to register. We’ve designed this program to give our special friends a chance to roll up their sleeves and enjoy the kitchen experience with a volunteer. Each event features a hands-on culinary opportunity, a related craft project or story reading, and some special Jewish tips & recipes for the kitchen. 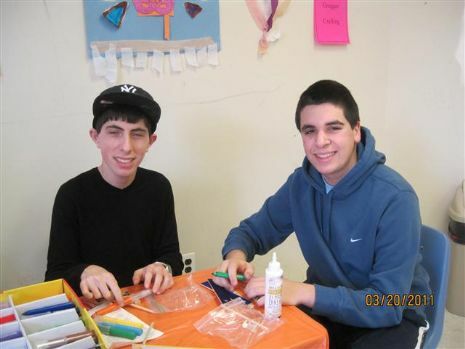 The Cooking Circle is for children and teens with special needs ages 6 and up, taking place at the home of Mrs. Stephanie Sorkin , 33 The Oaks, Roslyn NY. If you would be interested in signing up for this program, volunteer or participate in any form please let us know by emailing FriendshipCircle @ChabadRoslyn.com or calling the office at 516-484-3500. Payment High School Students are free of charge. Click here for our full color Volunteer Poster - Know someone who may want to volunteer? Hand it to them!